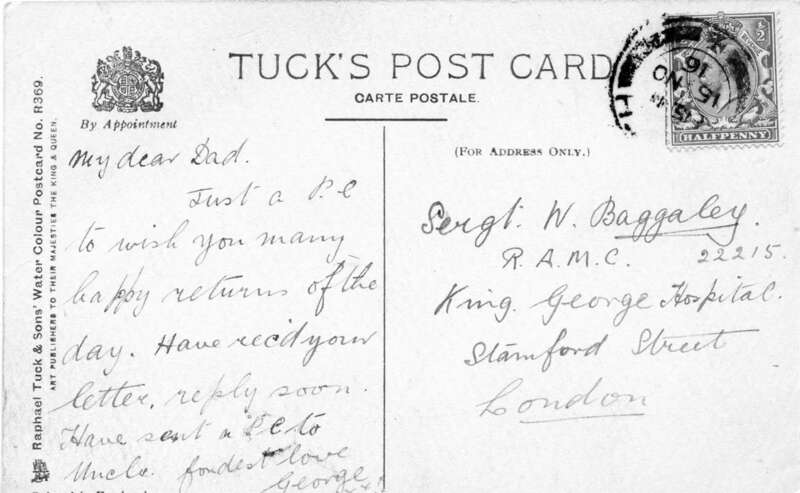 Postcard showing Winifred's fathers address at King George's Hospital, London. During the 1914-18 War and my Father and brothers being in the War we had to take [in] two Women Policeman from Langwith, Munitions Factory. 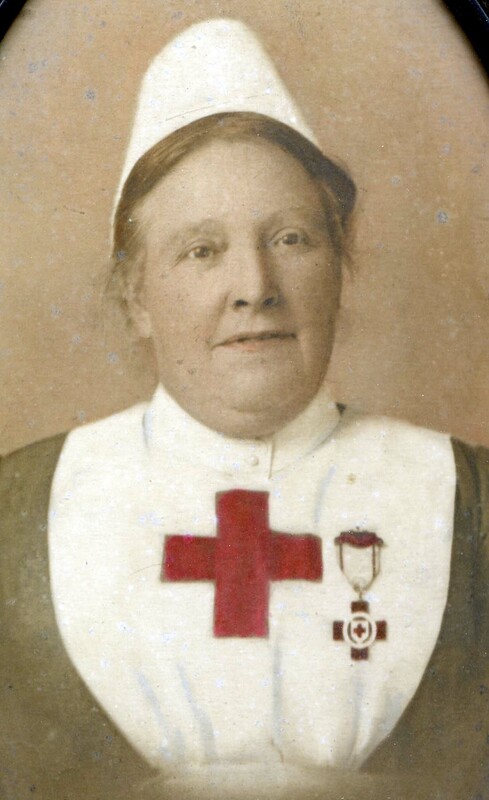 My mother who had been previously night nursing at the hospital had the misfortune to break her leg. One day a friend of the family [Mrs Brown] came to tea, and who was very clever at reading the tea cups. It was of course only done for fun.After tea she had read my mothers cup and said she would be going on a journey with two people in uniform, to a large building, but she could see no cure. Eventually this came true. She was taken as a special privilege to King George’s Hospital, London for treatment, My father being a Quarter -Master Sergeant there, this is how it tuned out to be true, two women police took her there. Here 25yrs have elapsed. During the years we had gone to live at the Old Vicarage Grove House my Father having passed away, we were there 31½ [years], a lifetime, the reason gave I up my job and went there, my Mother was unable to do our housework, so we together did work in the Parish. Then came the Second World War, Grove House was a lovely old place and had underground passages. We had to decide which to have, a canteen, for the troops or evacuees (the canteen won). We had busy but happy times, things were organised, and rotas made for helpers at the canteen nightly. They came and reinforced the underground and put seats all round and electric lights in, when the sirens sounded the people in the streets cane with blankets, pillows each night luckily we were never bombed, they dropped them more in the country side. 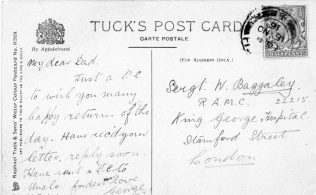 The Troops were billeted in the Drill Hall across the street, “I could tell you some stories.” One night a message came to expect a convoy at 10pm but they did not come till 2am. What an exclamation broke from them on opening the door to see a lovely fire blazing in the grate. They said, they had never been nearer to Heaven and they came in – many of them were so tired they fell asleep over the meal, but they had to go, as they were to be away again at 6-0am. I’m sure the LORD gave us strength to cope, as we were ready to feed and send them on their way we only had to charge 1 penny per cup, 1 penny a slice of toast, and still money was made to send to headquarters.